Have you guys started giving any thought to Thanksgiving yet? If not you need to get on it, it’s right around the corner! We usually keep things pretty traditional around here – roasted turkey, stuffing, mashed potatoes, cranberry sauce…you know the routine. But I like to make all those traditional things just a little bit more special on Turkey Day, if I can. I found myself with some dwindling chives outside and an-almost-gone-container of buttermilk last week when I made my favorite all-beef meatloaf, so I thought I’d mix them into mashed potatoes to make them a little more fancy. The slight tang from the buttermilk and the mild onion flavor from the chives were just perfect in the creamy mashed potatoes – making them delicious enough to eat plain, but not too overpowering that a spot of gravy on them wouldn’t be a welcome addition as well. I’m hoping to get another couple of Thanksgiving day favorites up before the big day, so keep checking back for more yummy ideas for your Holiday table. Put the potatoes in a large pot. Add the 2 salt and enough water to cover the potatoes. Bring to a boil over medium-high heat, reduce the heat to medium-low and simmer until the potatoes are tender when pierced, 15 to 20 minutes. Turn off heat, drain well in a colander, and return to hot pan to evaporate some more moisture. In a small saucepan over medium heat, combine the buttermilk, half-and-half, and butter. Heat until just warm and set aside. Using a potato masher, ricer, or the lowest speed on your stand mixer to mash the potatoes well. Slowly add in the buttermilk mixture, continuing to mash and combine until the potatoes are smooth and creamy. Stir in the chives and season with salt and pepper. Transfer the potatoes to serving bowl and serve immediately. This serves 4, but can easily be doubled or tripled to accommodate a larger crowd. 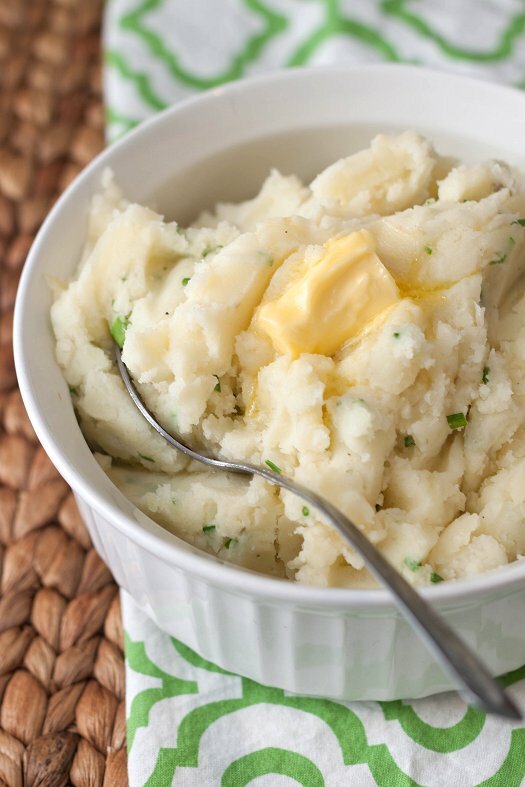 These are some lovely mashed potatoes! Almost too pretty to eat, almost. These look like some fantastic potatoes! Pinning!